Speaking of the Google Play store it's present on the Meizu MX3 in its Jelly Bean glory. It features several scrollable tabs - categories, featured, top paid, top free, top grossing, top new paid, top new free and trending. Apps usually have several screenshots (some even offer a demo video) so you can get an idea of what the app looks like before installing it. You can also check out comments and ratings, as well as the number of downloads and so on, to help you decide if the app is worth it. There are all kinds of apps in the Android market and the most important ones are covered (file managers, audio and video players, navigation apps, document readers etc.). Then there's the Meizu-built App Center. 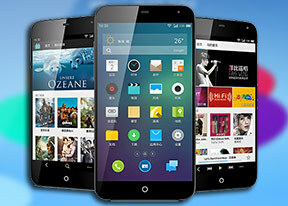 It has custom-made apps for Meizu devices but all of them are in Chinese, making them unusable for the non-Chinese user. Still many of the apps are free (paid ones are in Yuan) and there's a big line of categories to choose from, including Staff picks. The Meizu MX3 has a built-in GPS receiver, which managed to get a lock in about 20-30 seconds (with A-GPS switched off no less). If all you need is a rough idea of where you are (within 150 meters) you can use the Cell-ID and Wi-Fi network lock, which is very fast as well. Google Maps is an integral part of the Android package and we've covered it many times before. It offers voice-guided navigation in certain countries and falls back to a list of instructions elsewhere. You can plan routes, search for nearby POI and go into the always cool Street View. Popular places around the world feature pictures and reviews by people. Street view isn't available everywhere, but it is growing in coverage and is the coolest thing we've seen on a Maps app to date (that includes Aerial view in iOS). You can save maps for offline view, which caches them on your device's storage, but keep in mind that not all map info is saved (meaning not everything down to street level like businesses, POIs, etc. ).